The scientific approach to purchasing manufacturing equipment that will meet your customers' needs. There are many opinions, but you need to match your customers needs for their application, not the salesperson's opinion of what they are selling. You may think you're a sign shop, screen printer, photo lab or one of the many other businesses involved in producing large-format graphics - but you're not! You are just manufacturers of products. These products you produce have familiar names, but that's about it. As a manufacturer, you have to purchase equipment in order to produce the products you will sell to your customers. It is your job to select the best equipment you can afford and then make the product for your customer. Your customer doesn't care about your printing technology. They want to know two things: How much will it cost and when can I have it. How do you go about purchasing manufacturing equipment that will meet your customers' needs? This is the hard part. My uncle said it best when it comes to your own business: "Hey, if it were easy, everyone would be doing it." This article's approach is to apply science, not opinion, to make these decisions. A manufacturing facility should make intelligent choices based on facts as to what to use and when. 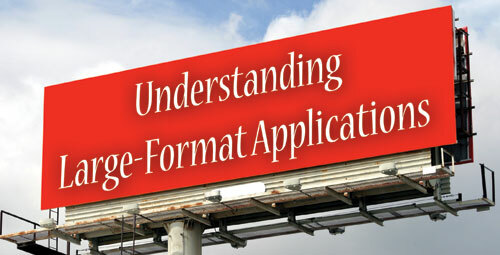 What printing technology is best suited for the application? What type of ink chemistry does it deliver and with which materials is it compatible? When and why should I choose the type of printing material and/or structural support materials referred to as substrates? Additionally, should the lamination process be required? What adhesives will work best with my imaging technology and equipment capabilities? What types of films are going to be required? As a Southern native, I use a lot of analogies to explain complicated things in a simple way. So you might want to think about an automobile manufacturer. They manufacture cars, trucks, mini vans and SUVs. Each transportation device is in a category by itself. You manufacture banners, rigid displays, pop-up displays and vehicle graphics. Each sign type also is in its own category. So let's look at how an automobile manufacturer produces trucks. Heavy duty trucks are manufactured for some customers, a light duty version for others and one truck somewhere in between. The three trucks have a lot of baseline similarities at first glance. They all have wheels, a cab and a bed to haul things, but at different price points and, of course, options. All are made in an effort to appeal to a broad range of customers. An application is an opportunity to manufacture a product such as trade show displays, outdoors signs, vehicle graphics, etc. As an instructor, I get fussy when I hear equipment vendors say you can make "trade show graphics." This is a broad category of signage. The last time I was at a trade show, I saw every possible type of sign manufacturing process on display from cut vinyl letters and laminated floor graphics to pop-up displays, fabric banners and printed direct-to-board rigid displays. All could have been manufactured with completely different processes, so which one is the best fit? To find this "holy grail" of manufacturing process to use in your facility is not that difficult. First, you must understand the application demands for the product you are going to manufacture. These application demands are always present but vary in their severity from application to application. Example one: The application demands for outdoor signage are considerably different from those of indoor signage. Example two: The application demands for pop-up displays are considerably different from flexible displays, even when both are used indoors. Furthermore, the imaging technology you choose, combined with the materials you select, will start to shape the complexity of the manufacturing process, quality aspect and the performance of the final product. Figure 2 shows the 10 application demands and their respective ratings from "not applicable" to "severe" for manufacturing an advanced construction vehicle graphics. Please do not confuse this with the variations of vehicle graphics at lower price points. To help you better understand these application demands, first ask yourself: How will they shape my decision making process as to the type of imaging equipment I will use and the materials I will select? Secondly: After I select the equipment and materials, how will they perform against the application's demands to ultimately define the quality of the final product, the complexity of manufacturing it and its relative performance? 1. Water/moisture. Yes, graphics get wet and water and moisture severely impacts the product. Because of this application demand, you print to vinyl, not paper, with some type of waterproof ink. What about the less obvious parts of manufacturing this product? If you live in Florida (as I do), are you going to do this outside when it's raining, or have you planned to bring the vehicle inside to make sure you can facilitate a constant delivery schedule for the customer? Are your bay doors wide enough if you are going to do buses? How big is your shop? 2. Light or UV exposure. All vehicle wraps will see color fading from UV exposure. Whether you're talking about color shift or color washing, it will happen. Printing with UV-curable inks will not avoid this. The question is how fast or slow it will fade relative to the expected life span of the product and cost (see number five in this list for further discussion). 3. Thermal exposure and temperature. In this application, temperature ranges are huge, from negative 20 degrees F in winter, to as much as 190 degrees F in direct sunlight (radiant heat energy in black areas). The vehicle wrap will have to withstand this radical temperature swing through many seasons. Temperature (heat) is one of the primary causes of color fading, not UV exposure. And while it's next to impossible to get most PS adhesives to adhere in 38 degree F weather, imagine the difficulties of applying vinyl when it is 95 degrees F outside and the vehicle surface temperature could fry an egg! 4. Handling and shipping. This demand is best explained by comparing graphics that are easily packaged ("rollable graphics") versus the cost associated with building wooden crates for rigid displays. It also has relevance to vehicle wraps. Wrapping several local locksmith vans is relatively easy because they drop off the van and pick it up after completion. Handling a national account, however, has a unique set of logistical challenges. It would cost too much to ship the cars from California to Florida, and it would be expensive to send your installer around the country. So, not only will you have to put faith in local certified installers, but you will still have to ship the graphics to them. How will you pack them and what will shipping cost you? Don't forget about do-overs - your installer might have a bad day. 5. Time or life span. Selecting a printing process such as screen printing, offset or inkjet is to be considered only a tool, like a paint brush with no paint. When examining the time or lifespan of the application, it is relative. For example, when screen printing was the only way to do large, four-color vehicle graphics (fleet graphics), the setup costs were so large that the product had to last five to seven years and only big customers could afford it. Today, direct-to-print high-speed inkjet delivers low cost solutions that are affordable to small companies for advertising their services and products, just like the big guys. They no longer need to last that long, even though they can. My point is this, time or life span is relative to cost of production. I like to see graphics changed before they wither from fading or creep-deformation because I get tired of looking at the same old thing and want to see my customers a bit more often than every five to seven years. 6. Resolution. When it comes to vehicle wraps, the resolution is relative to viewing distance and subject matter. To understand resolution better, if you can't afford a really big home theater TV, you just sit really close to your 21 inch high-resolution monitor (image size to viewing distance is relative, get it?). You just might look stupid doing it. Because you will not have a clue as to how small some text (type) might be supplied by a designer, higher is better. Most vehicle graphics will at some point be viewed up close, unlike a tractor trailer, where you have to step back just to see the big picture. In reality, 600 dpi is more than enough and less dpi will work until you can't adjust for banding. Your customer doesn't have to be a print expert to see banding. Higher resolutions will impact production print speed and RIP times, which will drive up costs (time is money). 7. Structural. To better understand how this application demand is relative to vehicle wraps, you need to understand creep deformation. Creep deformation is the tendency of a material to slowly move or deform under the influence of stress. It occurs slowly as a result of long term exposure, below the yield strength of the material. Creep deformation always increases with temperature. Many installers over-stretch pressure sensitive vinyls during the install, resulting in edge lifting or edge de-lamination. This is most apparent in summer as plasticizers evaporate over time, adhesives get soft from heat and vinyl shrinks. Additionally, the adhesion level of your inks to the chosen print media must be able to withstand pressure washing and automated car washing facilities. Over-laminating is still the best method to avoid rapid image deterioration and accelerated UV color washing from these processes. 8. Chemical Exposure. The printing technology you are probably using is solvent inkjet, which has good resistance to a wide variety of general purpose cleaners used for washing vehicles. However, the vehicle wrap will endure small amounts of gasoline or diesel fuel spilled on it when filling up. These petroleum-based products will be detrimental to the ink if it is not protected with the proper over-laminate. Of course, if the vehicle is not a total wrap relative to this area, the severity rating for this specific application demand decreases. However, many bug and road tar remover formulations are still detrimental to the ink. 9. Aesthetics. This is the area of psychology that deals with beauty and taste. While this is totally subjective, this particular application demand has relevance. Even though aesthetically, a high gloss finish on a new vehicle is very appealing to most consumers, it works against the whole concept of advertising signage "readability." Direct sunlight will cause a large amount of glare, making the message difficult to read. Using a luster finish when over-laminating will correct this. Additionally, because the luster film will refract more UV light from hitting the ink, a moderate improvement to color fading can be accomplished. 10. Cost. Materials used in manufacturing a product will be defined by all of the application demands discussed previously, relative to its severity. They are set for varying environmental conditions and customer expectations. Calculating the cost can be as simple as adding up the materials, labor, overhead and percent of profit. However, understanding the application demands and weighing them against their material selection will give customers a choice. Balancing the performance or duty cycle of the product with a simple price structure is an important issue with different types of customers and budgetary constraints. In manufacturing, the equipment and raw materials you purchase has everything to do with your capability to offer variations of product construction. Unfortunately, most manufacturers of graphic products don't have the in-depth knowledge about the application demands and performance differences derived from materials to make correct decisions. In a class I teach, we cover the 10 core products produced by manufacturers of sign products. Digging a bit deeper, we analyze the three variations of quality to help students gain a unique perspective as to how their product offerings relate to each other in regards to price, quality and performance. The bottom line is simple: How will you sell a product if you have no idea about how it relates to your competitors' offerings? What is it about your product that is different? If you don't know, then you are just a "me too" company, with no unique selling points to set you apart from the competition. With little to no variation in price point - severely limiting your opportunities to service a broad range of customers - you will be forced to compete on price alone, resulting in a slow and painful demise. Or you could come to the class. The choice is yours. Please choose wisely. This article appeared in the SGIA Journal, 3rd Quarter 200 Issue and is reprinted with permission. Copyright 2008 Specialty Graphic Imaging Association (www.sgia.org). All Rights Reserved.